I spent this past week in Orlando at Cisco Live! 2013. The first time I went to this convention, it went by the name Networkers and was held in Denver. That was 1998. I attended Networkers the next year in Vancouver and Whirl came along with me. We tacked a few extra days on at the end to play tourist. A lot of things change in 15 years. The attendance back in the late 90s, at the height of the dot-com boom was still only about 3000 people. Every CCIE proudly wore a leather jacket with their number embroidered on it. I was still wet behind the ears, wide-eyed and naïve. Now I suppose I’m older. More grizzled. Less impressed by flashy things and more interested in practical knowledge that will improve my work. My boss suggested I go this year. He attended two years ago, and knew that there is real value to be obtained– and that there is some fun to be had as well. So I booked up my class schedule, found a hotel, booked a flight and set off. I also packed my swimsuit and my Blackhawks sweater. The suit was so I could practice with Team Orlando Masters at the YMCA Aquatic Center on International Drive. The sweater was because game six (and game seven, if necessary) of the Stanley Cup Finals would be played while I was there. And I was glad for both of them. I got two practices in with the Orlando Masters, and on Monday night a made a bunch of new friends at Miller’s Ale house. We turned the beer garden into our own Stanley Cup Finals party. At the end of the night we must have played “Chelsea Dagger” on the jukebox at least nine times in a row. I attended sessions every day starting around 7:30 and going until about 5:30 or 6:00. Everything from radio frequency specifications and antennae design to the latest features in Cisco’s newest datacenter switches– a monster of a thing that will push 83 terabits/second through the switching fabric. I went to the big customer appreciation event on Wednesday night at Universal Studios– where we closed out the park and had a private, catered party for the 20000 people in attendance. I toured the World of Solutions expo where hundreds of various tech companies had booths set up. It was quite enlightening, nearly ten times the size of my previous visits. Anyway. that’s enough preamble. Here are a few of the koans of wisdom I gathered from my four days at Cisco Live! 2013. In January I started swimming regularly for the first time in about twenty years. When I wrote about it at the time I said that I wasn’t swimming for competition; I said that I was just doing it for myself. And I think I meant that. Now it’s ten months later and I’ve been steadily adding more and more to my workouts and swimming has pretty much taken over from my other exercise routine. I started off swimming 1000 yards three days a week. As I got more comfortable, I added a fourth day and then a fifth. Then I started edging up the distance. I was swimming faster and requiring less time to rest. I started keeping a log of my distance totals and every once in a while I would time myself. You know, just to see how I was doing. Nothing serious. Of course there was absolutely nothing vaguely competitive about any of this. Racing never crossed my mind– not even when I caught myself secretly trying to pass the guy in the lane next to me. 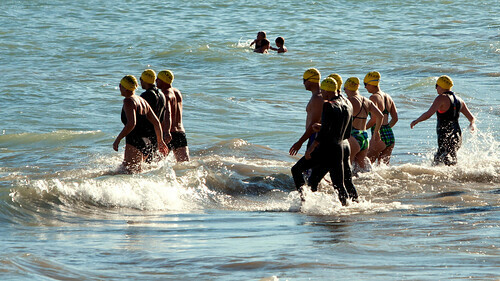 I found Swimplan and punched in some of the statistics I’d gathered over those first few months to establish a profile. I have really appreciated Swimplan and have recommended it to several of the other regulars I’ve met at the pool. That first workout added fifty percent more to my regular workout, and it’s kept steadily increasing ever since. Up until last week, I was averaging a total of 10000 yards per week. I’ve fallen into a comfortable routine — five days on, two days off — swimming Friday through Tuesday. On the three weekdays I swim over my lunch break; The pool is just two blocks away. On the weekends, I try to swim first thing in the morning. Then a couple of things happened in rapid succession that altered my thinking. In one week at the pool I had three people ask me if I swam competitively: two mentioning the US Masters Swimming program, and the third talking to me about triathlons. At the time, this seemed like coincidence, but now I can say with some confidence that it probably wasn’t entirely coincidence. 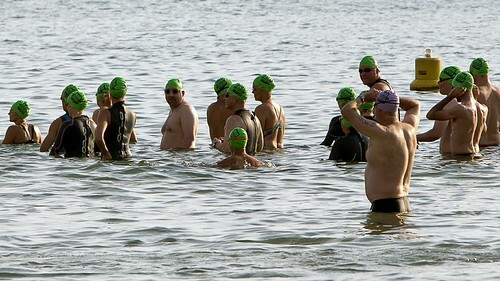 The Chicago Triathlon, the Wisconsin Ironman and the Chicago Marathon were all scheduled to run within about a month of the comments, marking the culmination of the summer triathlon season. I had a new goal. I’d accomplished most of what I’d sought out to do. I was comfortable in the water again. I was getting stronger and continuing to lose weight. I was feeling better about myself. The objective data was there for anyone to analyse: times were quicker, distances longer. It was time to step it up again. 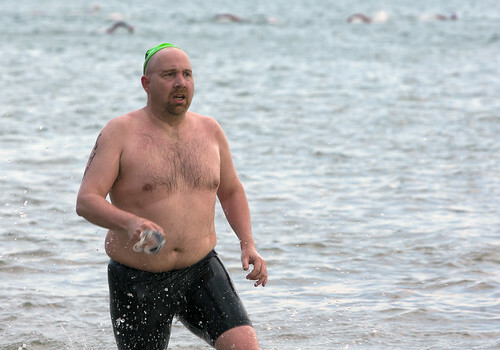 So last weekend I signed up for Masters swimming. I joined a team and last night I attended my first official workout. The Chicago Blue Dolphins practice out of the UIC facility about a mile and a half from home on the southeastern corner of the campus. It has two gorgeous pools in the building. The large pool is a huge pool: eight lane 50-meter by ten lane 25-yard pool and a large diving well offset on the deep end. The small pool is a more typical six lane 25-yard pool. The workouts are challenging, effectively doubling the longer workouts I’ve been doing on my own through Swimplan. New drills, new techniques and coaches there to help make adjustments and provide encouragement. From what I can tell, the competitive swim meet season starts in January, so I’ve got a bit of time left to practice before then. Regardless, it’s a powerful motivation and one I’m really excited about undertaking.